A flattened section on the master link opens up additional, universal connection possibilities. 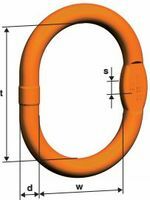 It is ideal for the simple, speedy assembly of I- and II-leg chains using Connex connecting elements, as a master link in welded systems and as an end link. Its inner dimensions are larger than those of the AW master link, making it suitable for larger crane hooks or special hooks. The MW enlarged master link must not be used for IV-leg chains, except when combined with BW transition links in VMW IV-leg assemblies. Manufactured according to EN 1677‑4 with mechanical values according to G10. With CE-marking and full operating manual. See table below for the maximum crane hook size as specified by DIN 15401 and DIN 15402.